It's Yuki here with a fun card featuring the new "Old School" set that was just released this month. I grew up playing Mario Bros. and I was so excited to see the warp pipe included in this set! I started off by coloring the warp pipe with Copic Markers: G03, G05, G17. I die cut a piece of white and green cardstock using a stitched rectangle die. For the focal panel, I created my own mask by die cutting a piece of clear acetate using a stitched cloud border die. The nice thing about using acetate is that you can continue to reuse the mask. I used the mask to apply "Tumbled Glass" distress ink. Once my sky was complete, I die cut the green piece of cardstock using a grassy border die. I tucked the warp pipe behind the grass. I then white heat embossed the sentiment onto a piece of black cardstock and die cut it using a speech bubble die. For the background, I used red and white pattern paper. I die cut a white panel using a stitched hill die along the left-hand side for some added interest. 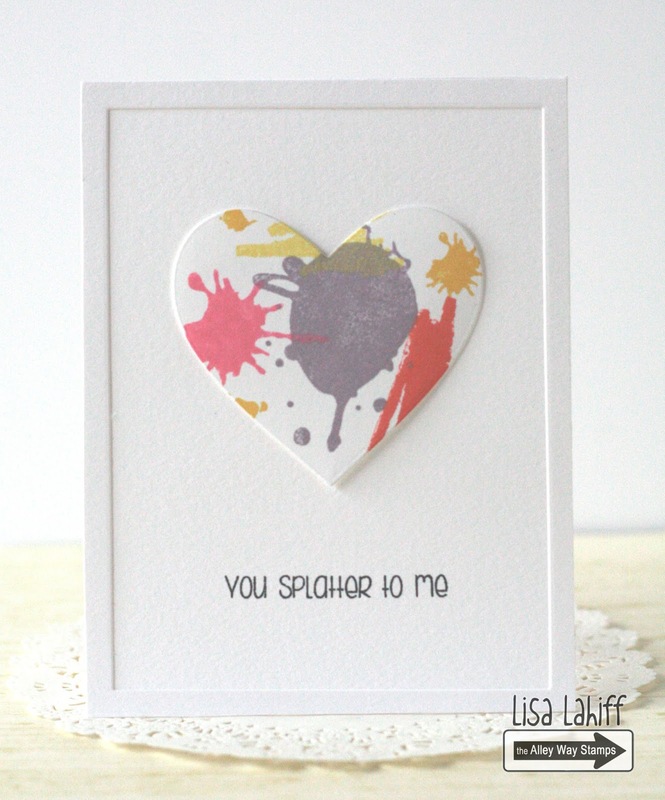 I hope you enjoyed my card and visit my blog for a full list of supplies! 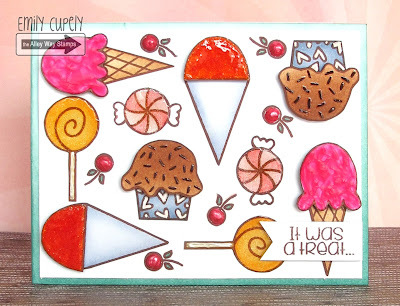 Hi guys, this is Emily Cupely with my first video tutorial for TAWS!! In today's card I used several techniques with the Brain Freeze stamp set, which I'll be showing to you in the video tutorial below! 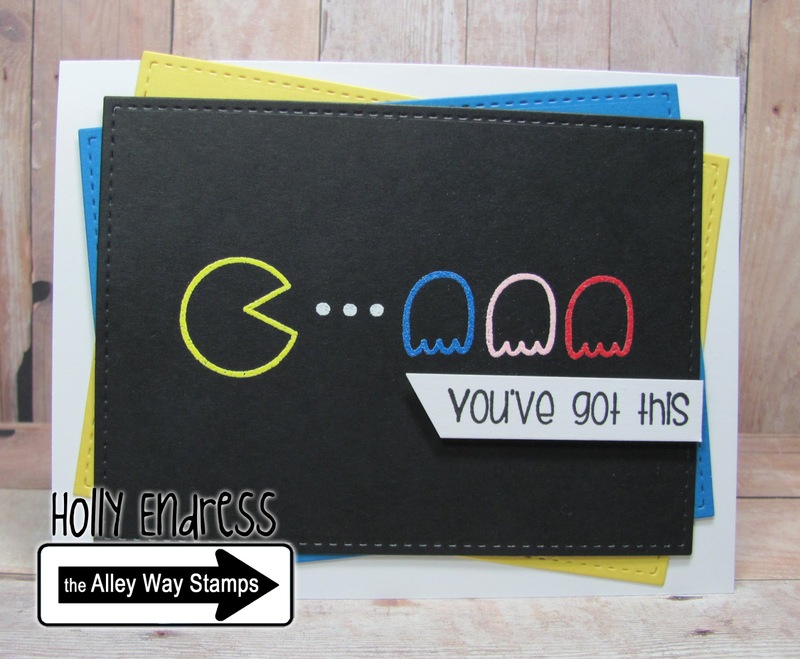 Hi everyone it's Holly here with a fun Pac-Man inspired card using the fun new set Old School. 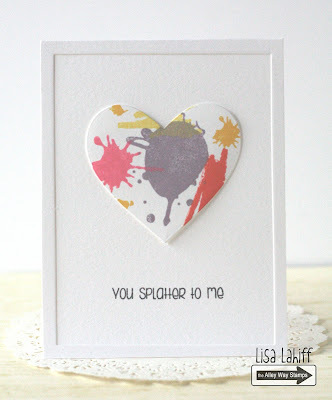 I created the bold colors with embossing powders. What fabulous cards! Love the little tip on using the edge of a die to create clouds!